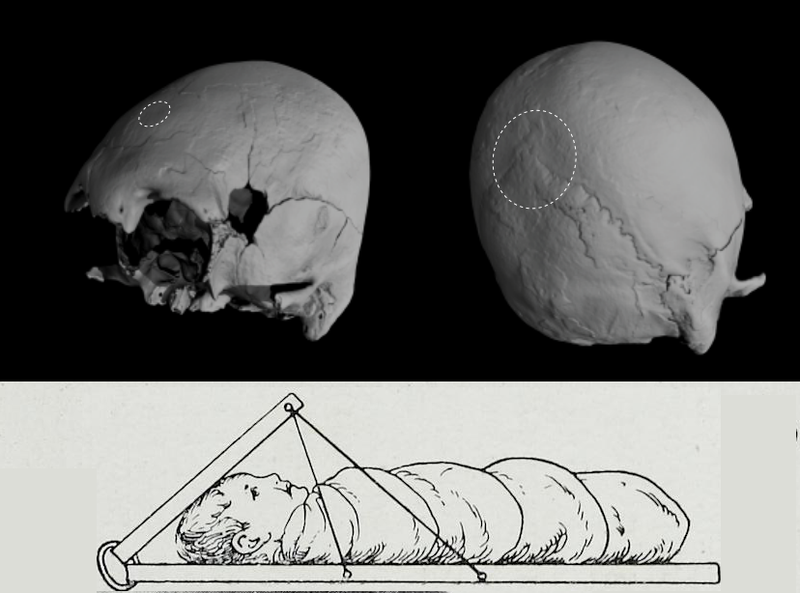 Many modern societies carry out head binding, wrapping up a child’s skull to force it to grow into a specific shape. We’ve known this practice has a long history, but just how long is a mystery. However, a newly discovered skull from China shows it stretches back further than we thought1. In doing so, it challenges not just our understanding of head binding; but the dawn of civilisation as we know it. The skull in question was found in the water of Songhuajiang River in Northern China and features some pretty severe cranial deformation1. The skull from the front (left), side (middle) and other side (right). Being an underwater find, it’s very mysterious. Archaeologists need context to figure out what’s going on, but to tools, animal bones, or even rocks were found that might give the skull context1. Despite this lack of contextual data, researchers were able to learn a lot from just the skull itself. Anatomical traits suggest this was the skull of a male, maybe ~24 years old. Stable isotopes in the bone show he was eating a fish-heavy diet. And carbon dating finds he lived around 11,000 years ago; making him the oldest known example of such severe head binding1. In fact, the archaeologists were even able to figure out how his head got so weird. See, some parts of the skull are relatively flat. This happens when someone ties something flat tight to the infants head, shaping its growth. It’s sometimes called “tabular head binding” and has been documented elsewhere, with similar flattened parts on resulting skulls1. 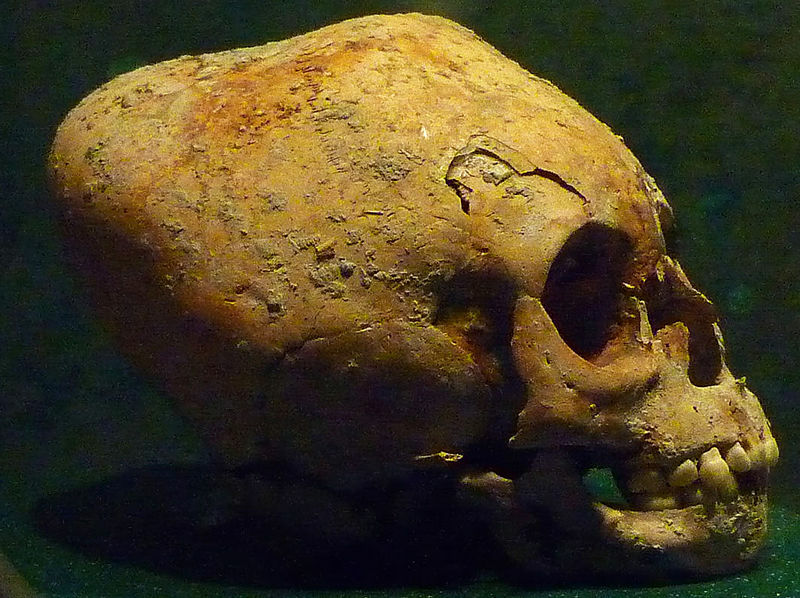 Now, at 11,000 years old this skull is pretty ancient. But here at Filthy Monkey Men, we often talk about stuff that happened millions of years ago. Why bother with something so new? Well, it’s still pretty cool. Also, this skull comes from an important time in human history. 10,000 BC marks the start of many societies shifting away from a hunter-gatherer lifestyle towards farming. With it came all sorts of cultural changes, like the concept of inheritance. And in that context, the Songhuajiang skull makes sense. Head binding has to be done young, so there’s no way this guy earned it. Clearly, it was done because of something their parents had or did. Which you might expect to start seeing in a society shifting towards farming1. Except that the diet of this dude indicates he was still a hunter-gatherer1! In other words, this skull suggests that some of the cultural changes we associate with farming actually predate it. This isn’t the first time we’ve found something like this. 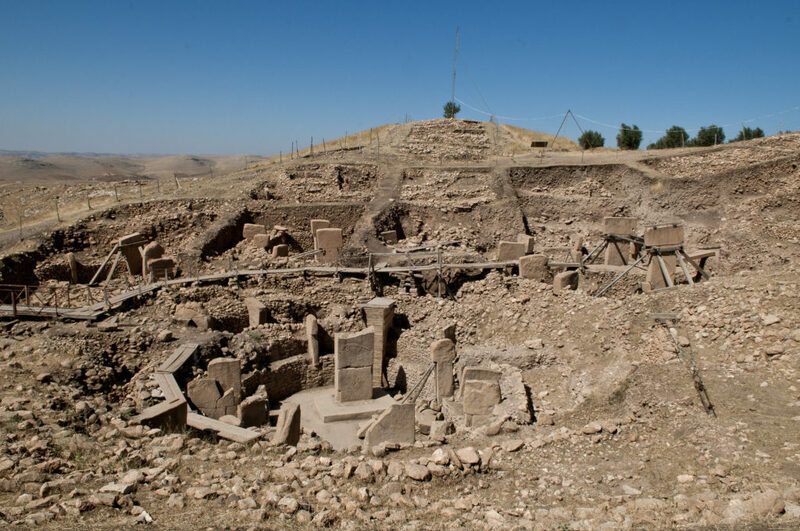 Hunter-gatherers also built massive monuments like the kind we thought only farming cities could create. In short, this one example of head binding tells us social evolution is way more complicated than we thought. Which is pretty impressive for a skull found with no context. It turns out archaeologists can always find a way to get ahead. Ni, X., Li, Q., Stidham, T.A., Yang, Y., Ji, Q., Jin, C. and Samiullah, K., 2019. 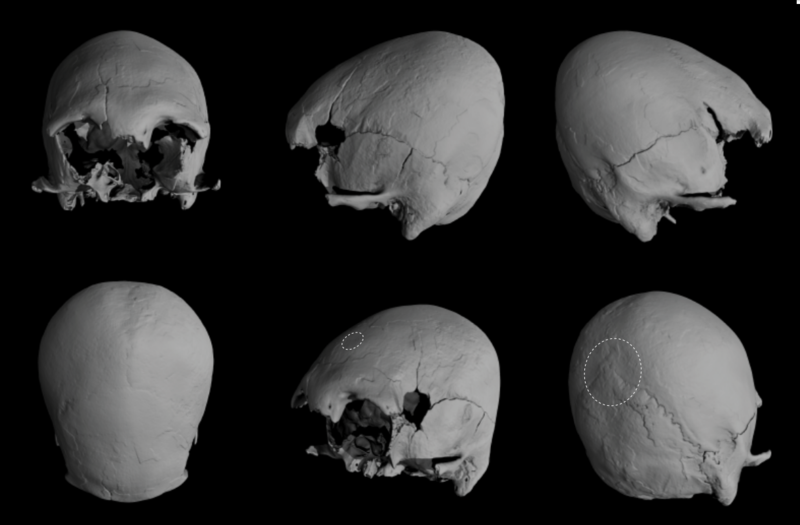 Earliest-known intentionally deformed human cranial fossil from Asia and the initiation of hereditary hierarchy in the early Holocene. bioRxiv, p.530907. Previous post: How did the Australopithecus sediba fossils die? First known examples were neanderthal. It’s a possibility, although the evidence isn’t that clear cut. More thorough tests for deformation either find the Shanidar skulls have too much damage to measure, or don’t score as artificially deformed. Clark, J.L., Dobson, S.D., Antón, S.C., Hawks, J., Hunley, K.L. and Wolpoff, M.H., 2007. Identifying artificially deformed crania. International Journal of Osteoarchaeology, 17(6), pp.596-607.